On Wednesday the European Parliament is going to debate a motion, ‘Combating anti-Semitism’ that includes support for the bogus International Holocaust Remembrance Alliance definition of anti-Semitism. I have sent a number of MEPs a letter asking that they oppose Clause C2 of the motion supporting the IHRA. You can see my letter here. I am pleased to say that the Green group in the European parliament will be opposing the definition. 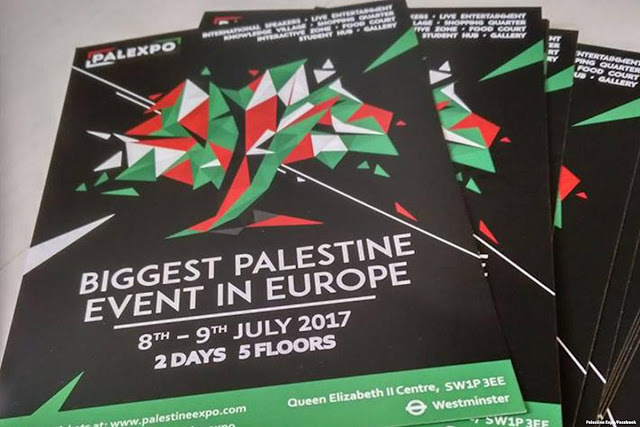 There is no doubt that the far-Right, Le Pen and co. will be only too happy to support the IHRA. 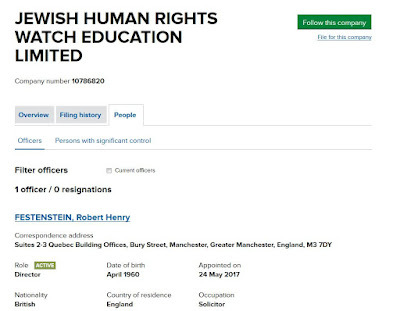 After all anti-Semitism and Zionism have always gone hand in hand and the IHRA definition has nothing to do with anti-Semitism and everything to do with supporting Israel. Victor Orban, the racist Prime Minister of Hungary, who has villified and demonised asylum seekers at the same time as seeking to rehabilitate the anti-Semitic rulers of Hungary in the pre-war period, has no problems supporting the IHRA definition precisely because it has nothing whatsoever to do with opposing anti-Semitism. 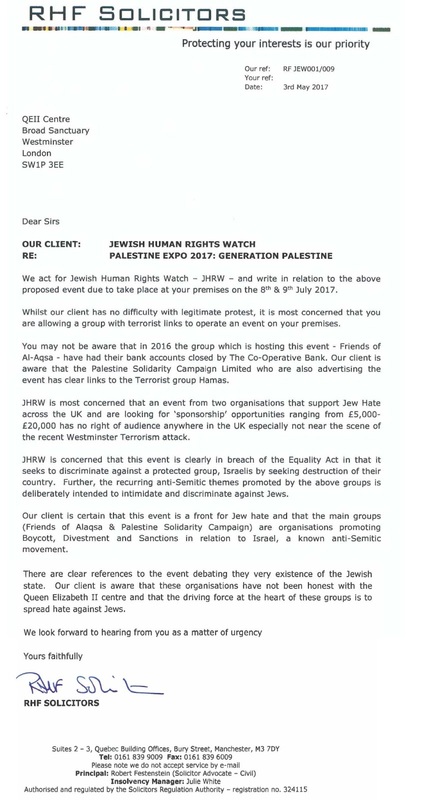 I am therefore even more surprised to find that Britain’s only Green MP, Caroline Lucas, the MP for Brighton Pavilion, who has previously claimed to support the Palestinian cause, has signed up to support this bogus definition of anti-Semitism which the far-Right Zionist Campaign Against Anti-Semitism has campaigned for. 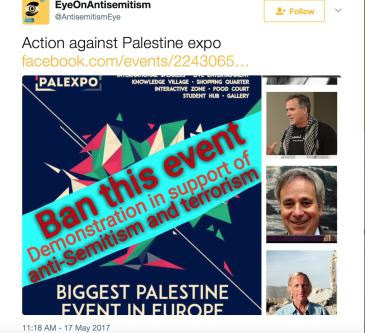 Already the IHRA definition of anti-Semitism has been used to stop Israel Apartheid Week at one university, has meant restrictions at Exeter University and UCL and has led to repeated attempts by Zionist organisations in this country to prevent speakers such as Jackie Walker and Tom Suarez speaking. The IHRA definition of anti-Semitism is a menace to freedom of speech and liberty. In the wake of the Manchester bombing there are increasing attempts to curtail our liberty in the name of fighting terrorism. I realise that being a Green means that you have no guiding compass politically. Capitalism for most people in the Green Party is something that can be tamed and reformed. It is this lack of basic political principles that can lead to someone like Lucas giving support to the Zionist attempt to clamp down on support for the Palestinians. 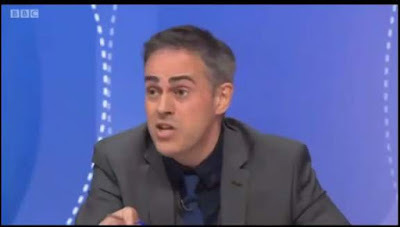 Another example of Green cowardice was the performance of Lucas's co-leader Jonathan Bartley on Question Time earlier this year. As the rest of the Establishment hacks lined up to call for Ken Livingstone's expulsion from the Labour Party for daring to tell the truth, Bartley demonstrated what a political pygmy he is when he joined the mob. I hope that others in the Green Party will give Ms Lucas a hard time. Like most Greens who get elected into positions of power, she has already become part of the British establishment. In Germany Die Grunen when it formed a coalition with the SPD with Joshka Fischer as Foreign Minister, became the first German government to send troops into battle in a foreign country, Afghanistan. 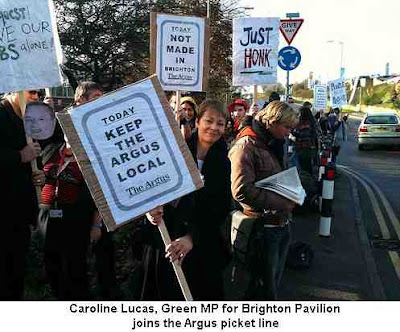 Without any class politics the Greens are destined to drift politically as Caroline Lucas demonstrates. Below is an Open Letter to Ms Lucas taking her to task over her support for this fake definition of anti-Semitism. As you will be aware, following the Home Affairs Select Committee Report Antisemitism in the UK, Theresa May adopted the International Holocaust Remembrance Alliance (IHRA) definition of anti-Semitism. 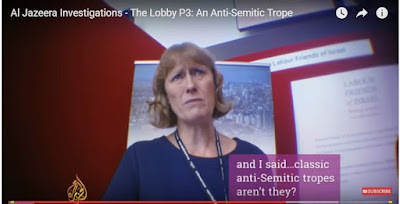 This Report was widely considered as politically motivated, lacking any evidential base and a hatchet job on Jeremy Corbyn by Chuku Ummuna of the Labour Right and the Tory members of the Committee. The Committee had no terms of reference and it criticised a number of people from whom it had refused to take evidence. This Wednesday the European Parliament will be debating a Motion on Combatting Antisemitism which also recommends adoption of the IHRA definition of anti-Semitism. I am pleased to hear that the Green group in the European Parliament has decided to vote against it. I am therefore extremely surprised to hear from friends in the Green Party that you support this bogus and racist definition of anti-Semitism. Racist because it proceeds from the basis that Zionism and Israel represents all Jewish people. 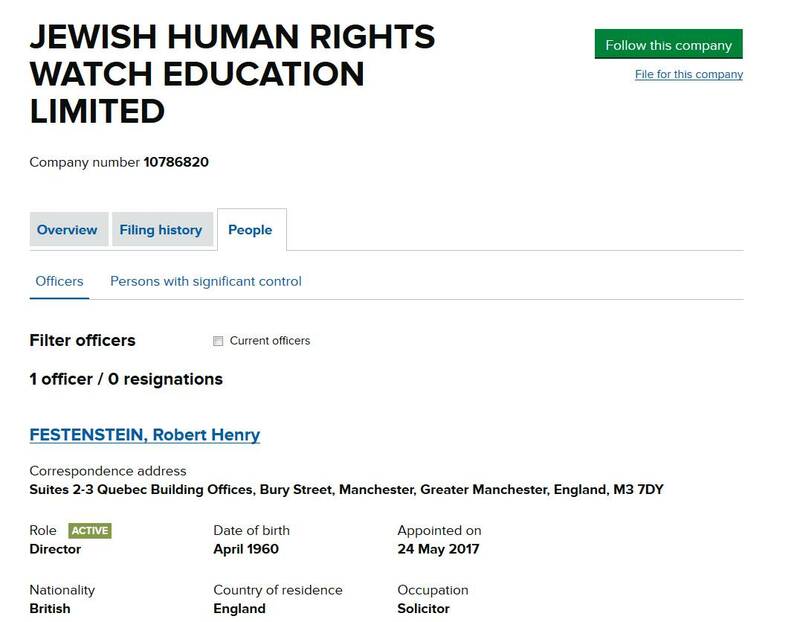 The IHRA definition of anti-Semitism is another name for the Working Definition of Anti-Semitism which the Fundamental Rights Agency removed from its web site in 2013 because it conflated support for the Palestinians with anti-Semitism. 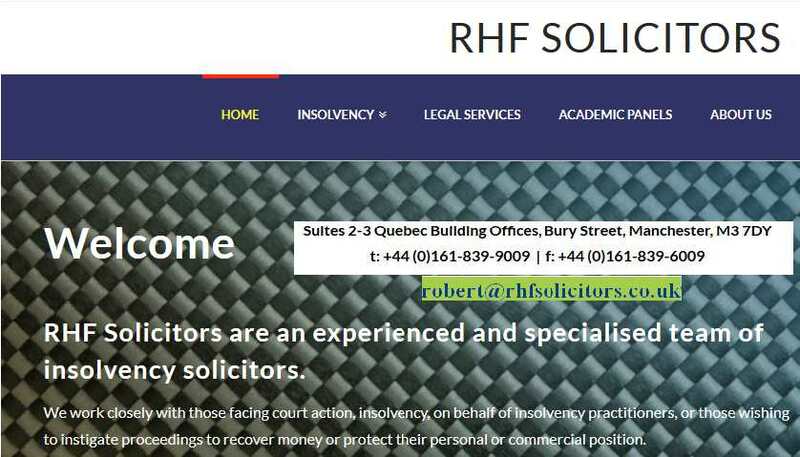 It has now been given a new lease of life. It deserves to be put back to sleep again, this time for good. 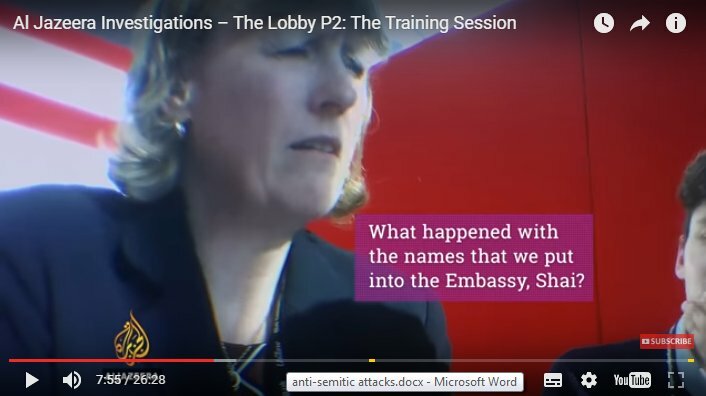 No one doubts the evils of anti-Semitism although the concentration on this form of racism to the exclusion of, for example, racism against Romanis or Islamaphobia, raises suspicions that the government’s real motive is to use peoples’ opposition to anti-Semitism to underpin its foreign policy alliances in the Middle East. 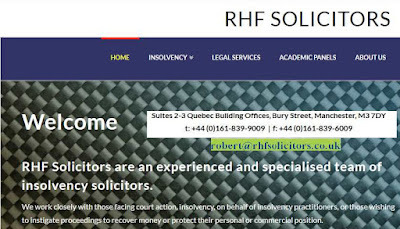 The IHRA, is an intergovernmental organisation consisting of 31 countries. It includes a number of countries which tolerate anti-Semitism, such as Poland under its far-Right Law and Justice government. Hungary’s government under Victor Orban, whose racist attitude to refugees needs no elaborating, is set on rehabilitating Admiral Horthy who presided over the deportation of some 430,000 Jews to Auschwitz between March 19th and July 9th 1944. [The Reinterment and Political Rehabilitation of Miklós Horthy, Randolph Braham]. Orban though has had no difficulty signing up to the IHRA because like many anti-Semites he is ardently pro-Zionist. That in itself should give you pause for thought. 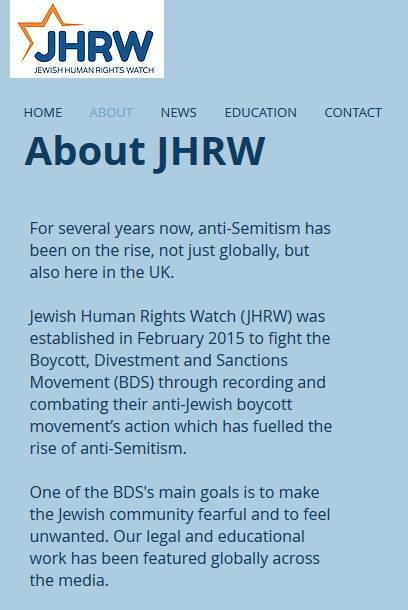 The IHRA definition has nothing to do with opposing anti-Semitism. Its sole purpose is to conflate opposition to Zionism and the Apartheid State of Israel with anti-Semitism. Seven of its eleven examples of anti-Semitism mention the State of Israel. 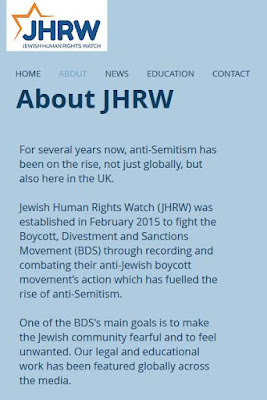 By identifying Jews with the actions of Israel, the IHRA is likely to increase not diminish anti-Semitism. Brian Klug, when giving a talk What Do We Mean When We Say ‘Antisemitsm’? 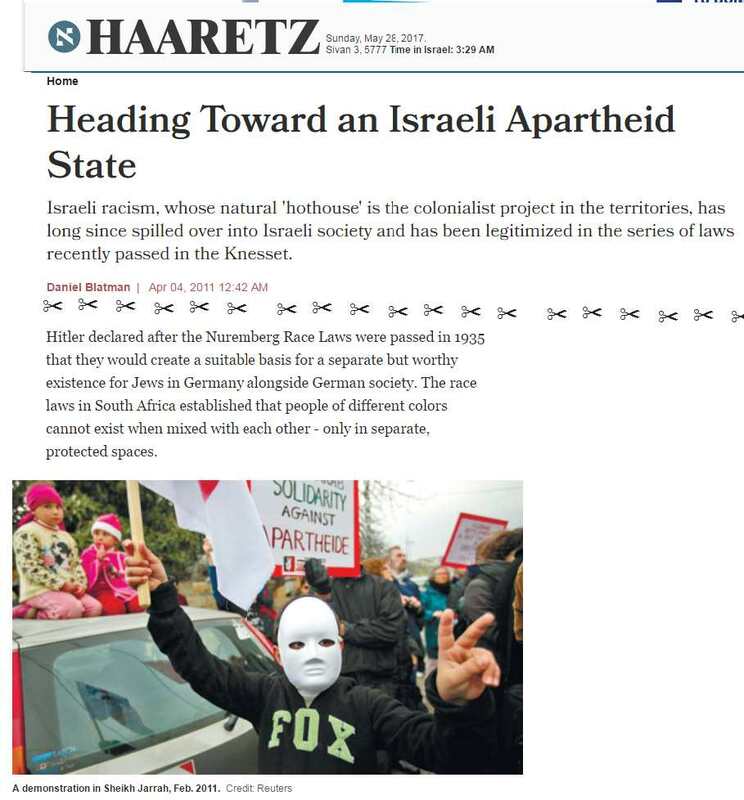 Echoes of shattering glass’ at the November 2014 International Conference at the Berlin Jewish Museum “Antisemitism in Europe Today: the Phenomena, the Conflicts” produced a definition of anti-Semitism in 21 words: ‘antisemitism is a form of hostility to Jews as Jews, where Jews are perceived as something other than what they are.’ The IHRA definition needs 409 words, because its purpose is not to define anti-Semitism but to conflate anti-Semitism and anti-Zionism. 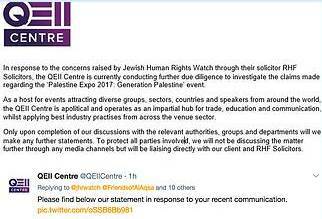 The IHRA definition of anti-Semitism includes ‘Holding Jews collectively responsible for actions of the state of Israel’. Ironically that is the main purpose of the definition. 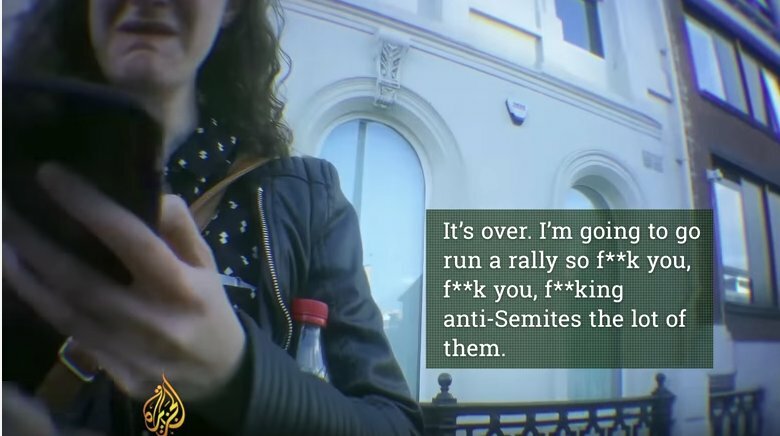 Anyone who is seriously concerned about anti-Semitism and indeed any form of racism, should be determined to separate off Jewish people from the actions of Israel. 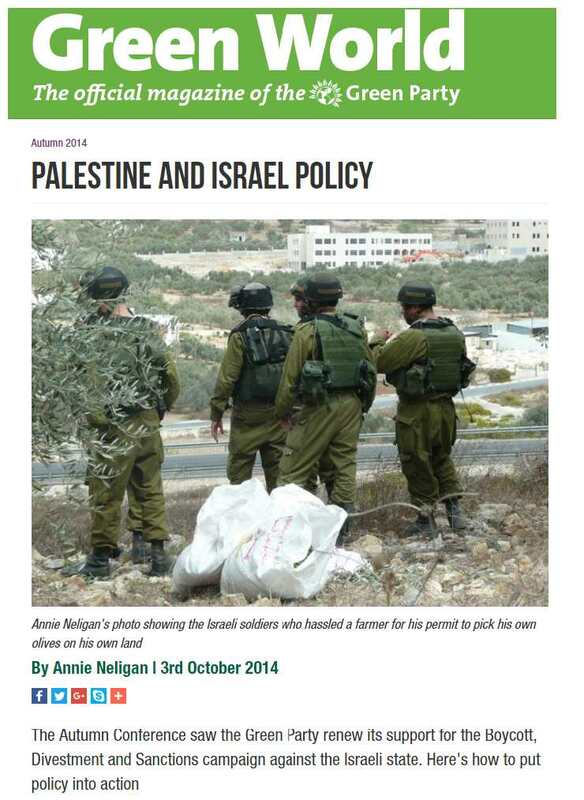 To associate Jews with the actions and policies of Israeli state, is to invite anti-Semitism. If calling out Israel as a racist endeavour is anti-Semitic, as the IHRA definition states, then we should be honest and admit that telling the truth can be anti-Semitic. 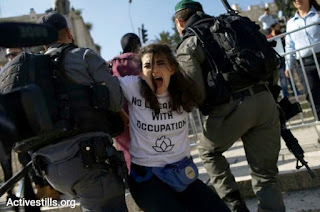 In a 2012 opinion survey 59 percent of Israeli Jews wanted preference for Jews over Arabs in admission to government jobs and 49 percent want the state to treat Jewish citizens better than Arabs. 42 percent don't want to live in the same building with Arabs and 42 percent don't want their children in the same class with Arab children. 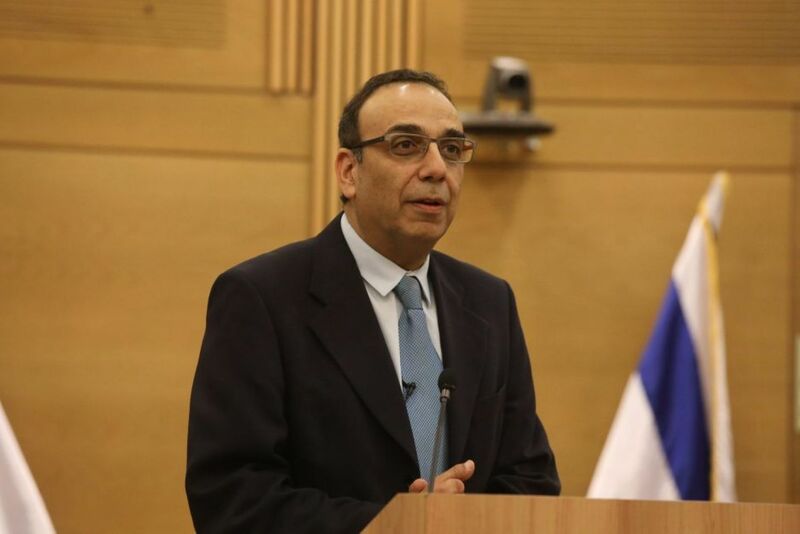 ‘Only’ a third wants a law barring Israeli Arabs from voting for the Knesset and 69 percent would oppose giving 2.5 million Palestinians the right to vote if Israel annexes the West Bank. 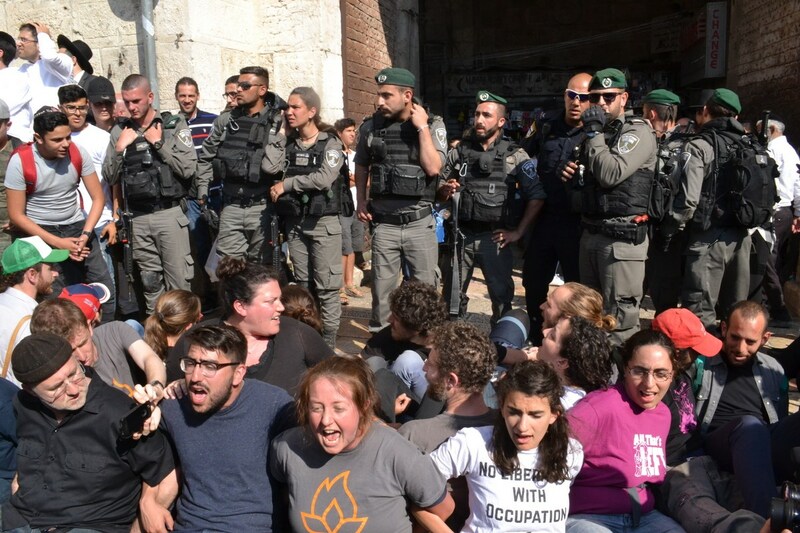 In last year’s Pew Research Centres survey Israel’s Religiously Divided Society, a plurality of Israeli Jews, 48% supported the physical expulsion of Israel’s Arab citizens. 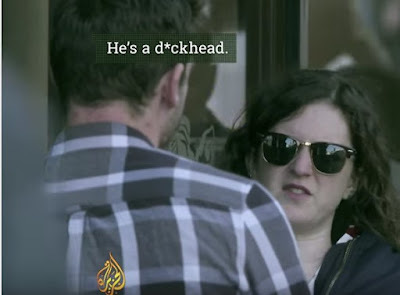 The prevalence of racism amongst Israeli Jews reflects the racist nature of the Israeli state. There is nothing anti-Semitic in stating that openly. 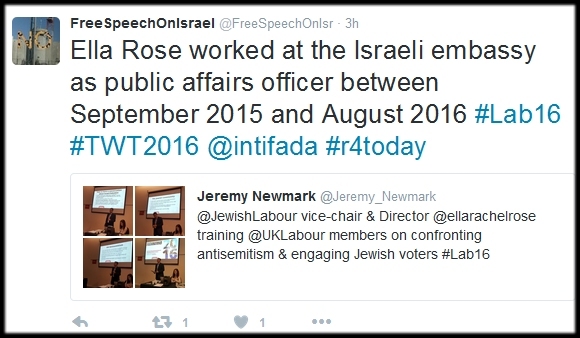 The IHRA definition of ‘anti-Semitism’ is designed to keep the truth about Israel and Zionism under wraps. It has already been used in Britain to close down Israel Apartheid Week at the University of Central Lancashire and to prevent activities at other universities. The IHRA definition of anti-Semitism is already having a chilling effect on free speech. I would hope that you reconsider your support for this bogus definition of anti-Semitism. .
Derk Walters is being expelled by Israel for his hostile and critical reportage of Israel. The pretext is visa problems. It is a logical culmination of a series of repressive laws such as those attacking human rights NGOs, refusing admission to Israel to supporters of BDS coupled with the refusal by Netanyahu to see the German Foreign Minister after he had agreed to see human rights organisations Btselem and Breaking the Silence. This followed a tweet from Walters that Israeli Arabs can’t talk about boycotting Israel. Ron Paz of the Government’s Press Office asked if the tweet could be construed as supporting BDS, commenting ‘I hope not’ which can be taken as a threat of deportation, since support for BDS in Israel is almost akin to a criminal offence. Israel, just like South Africa, doesn’t take kindly to being boycotted though they are more than happy to impose a forcible boycott on Gaza. 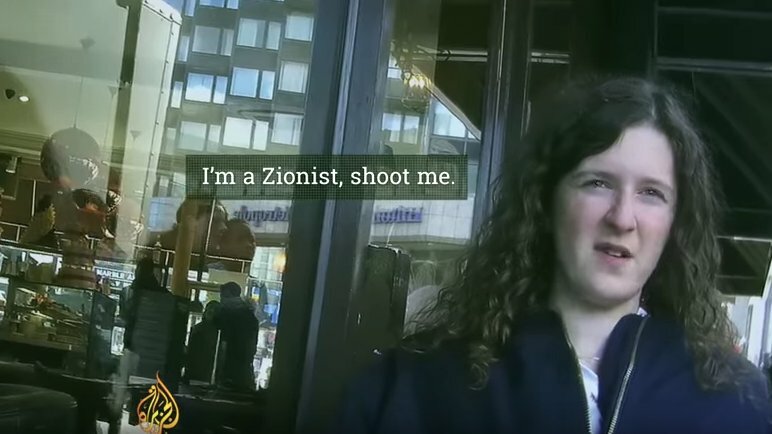 Derk Walters works for the Netherland’s fourth largest newspaper, but that is no obstacle when it comes to Zionist attacks on freedom of the press. This follows previous threats to the BBC if they didn’t behave, however the BBC quickly backtracked and changed its headlines. 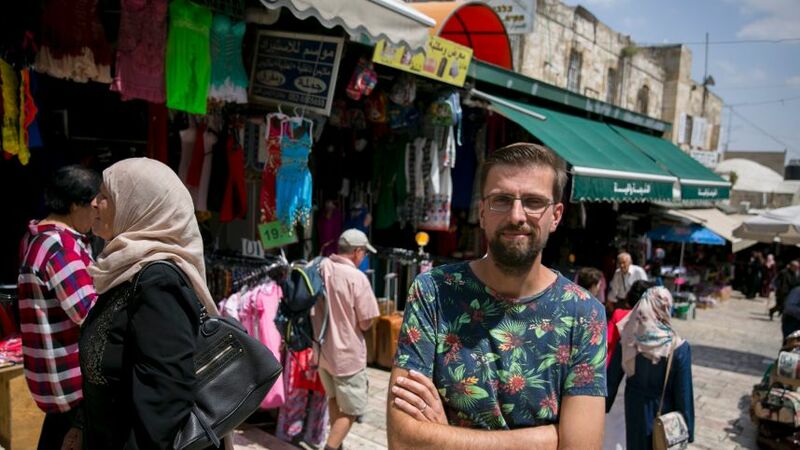 Israel is refusing to renew the visa of a Dutch journalist who has lambasted Israeli policy toward the Palestinians in the West Bank, though the Government Press Office says he knowingly worked without a visa extension or permit. Derk Walters has criticized Israeli policy in the Netherlands’ fourth biggest newspaper, NRC Handelsblad, though the GPO, which operates out of the Prime Minister’s Office, denies that this the reason for his expulsion. Last year, Walters criticized Israeli actions in Hebron in the West Bank and tweeted about boycotts as political action against Israel. Walters has been reporting from Israel since 2014. 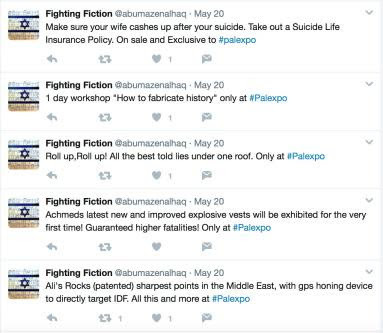 In January 2016 he ran an article describing constant friction between the Palestinians and settlers in Hebron early in the wave of stabbing and car-ramming attacks against Israelis. He wrote that because of collaboration between the Israeli army and settlers, the Palestinians did not believe that the Israeli army was actually acting against assailants. Instead, it was planting knives near the bodies of the dead. 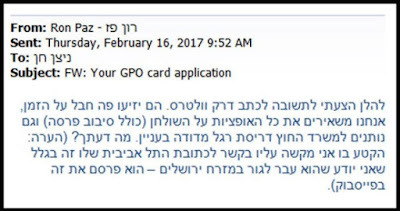 On January 13, 2016, a day after a Walters article on Hebron ran, he received an email in English from Ron Paz, the GPO’s foreign press chief. Paz added that a Walters headline saying that 175,000 Palestinians in Hebron were captives of 600 Jewish settlers was anti-Semitic. 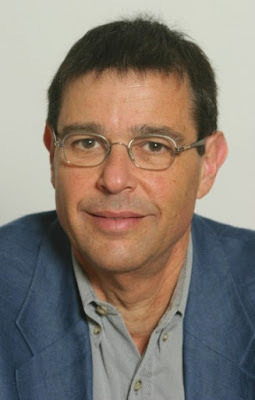 NRC’s editor-in-chief, Peter Vandermeersch, responded to Paz, criticizing the Israeli’s email to Walters. Four days later, Walters came to the GPO in Jerusalem to pick up a press card. He says he not only did not receive one, he was assailed by complaints, especially about the Hebron article and his paper’s coverage of Israel in general. He says he only received a press card after the Dutch ambassador intervened. Walters then added his own interpretation: Israeli Arabs cannot talk about boycotting Israel because they could be persecuted for it. 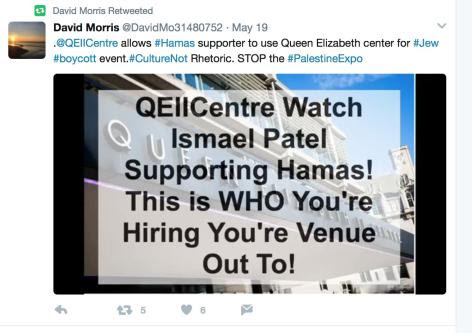 Paz wrote to Walters asking if the tweet could be construed as supporting BDS. ‘I hope not,’ Paz wrote in an email. At the end of 2016, when the GPO rejected Walters’ request to renew his visa and press card, it cited as grounds that NRC is not a recognized media organization under the GPO’s standards because its editor-in-chief is a board member and thus it suffers conflicts of interest between its commercial and editorial sides. The GPO later withdrew that argument after the Dutch Embassy intervened. GPO head Nitzan Chen suggested that Walters receive a visa and press card for three months, during which the newspaper could get organized as the GPO required. The paper took that to mean that the GPO wanted Walters to be expelled. Walters says that based on his previous experience with the GPO, he decided not to answer that particular email; instead, he told his paper it should talk with the GPO, or the Dutch government should use diplomatic means as in the past. In February this year, Walters received another email from Chen, saying that since he had not answered the email from December 2016, he had been working illegally without a permit since December 20. The GPO also demanded proof that he lived in Tel Aviv, as written in his visa application. Paz accidentally attached to Chen’s letter internal correspondence in which Paz wrote about his proposed answer to Walters. This included references to making the other side sweat and leaving all options on the table including a U-turn, and letting the Foreign Ministry get involved. The internal correspondence accidentally sent to Walters. Paz said the need for Walters to prove his Tel Aviv residence was based on his knowledge that Walters had actually moved to East Jerusalem – he posted it on Facebook. NRC says the correspondence between Paz and Chen increases suspicions that Walters and the paper are being harassed. The temporary permits given to Walters expire in July and, he says, the GPO told him that his permits would not be renewed. In a letter published this week in Dutch, Vandermeersch, the NRC editor, wrote that there was no way to interpret this decision other than as an attempt to prevent the publication of articles critical of Israel. Vandermeersch wrote that strangely, the April 4 letter from the GPO did not mention the tenor of Walters’ reporting. The nature of his articles was never a factor in the Israelis’ decisions, which contradicts Israeli accusations that Walters was engaging in improper activism. Vandermeersch also quoted from a GPO statement saying the office believed that Walters’ reports were professional and adhered to journalistic ethics. As a result, the way Israel was expelling its writer was a stain on a country that depicts itself as a nation of laws. Meanwhile, NRC has quoted Dutch Foreign Minister Bert Koenders as saying he regrets that Walters’ work permit has not been renewed. Journalists should write what they want under the rules of freedom of expression that apply in Israel too, Koenders said. 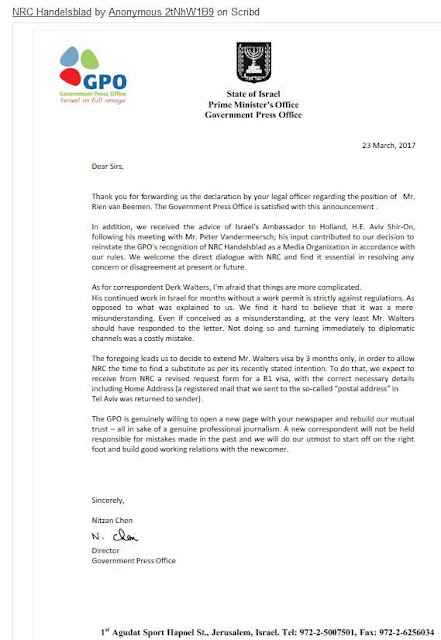 On Paz’s claim that he had contacted Walters at least twice over the reporter’s comments in the paper and on Twitter, Chen said the office indeed considers the ethics and credibility of journalists, universal journalistic ethics, but the GPO never made a connection between Walters’ writing and work permits. “We are an administrative authority that just inspects. We don’t care if he waxes critical. There are examples of Al Jazeera writers in English and CBS being much more radical or influential,” Chen said. In an English-language statement, the GPO added: “Unfortunately, both articles published by the Dutch paper NRC Handelsblad are tendentious, distorted and based on half-truths: the GPO has never conditioned its recommendation for work visas and press cards [on] the content published by one journalist or another. Nevertheless, when the GPO recognizes a substantial deviation from the facts and from universal journalist ethics, we request a clarification accordingly. This was the case of the article in question published by Mr. Derk Walters in Hebron in the beginning of 2016. 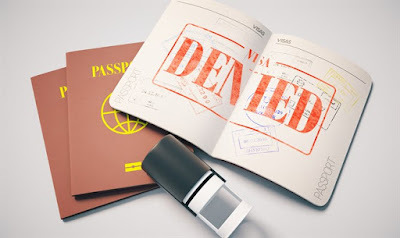 “The article’s headline, in which the reason for not extending the journalist’s visa beyond 3 months due to ‘activism,’ is an absolute lie, and the GPO has documents proving it. The article also claims that NRC requested the GPO’s response and did not get it − that is another lie. The GPO sent its response to the newspaper, and they did not bother publishing it. “Mr. Derk Walters has violated Israeli law by working without a permit for months. According to NRC’s position, he did so with intent and not as negligence. Following information the GPO received regarding the NRC failing to comply with the rules, the GPO turned to the journalist and offered a 3 month renewal for his permit pending clarification. However, Mr. Walters and the paper chose to ignore the offer and immediately turned to diplomatic channels, during which time the journalist continued to work in Israel without a permit. “Nevertheless, and beyond the letter of the law, after the GPO was satisfied with the NRC complying with the rules, the journalist was issued a 3 month work permit, and it was explained to the paper that it won’t be renewed due to the law violation above – to allow the paper time to send a replacing journalist which will receive permits by law. 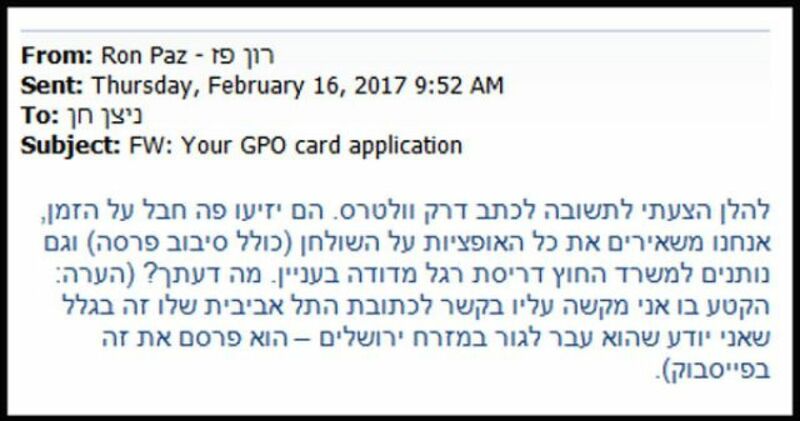 In December, the GPO told Australian journalist Antony Loewenstein that his GPO card was “under review” after he challenged MK Yair Lapid at a press conference and a media watchdog blog charged that he was not a journalist, but “a prominent anti-Israel activist” and “a public supporter of the Boycott, Sanctions and Divestment (BDS) movement,” quoting public statements he made. Ultimately, however, Loewenstein was permitted to keep his credentials and his visa until it expired in March. Given his plans to leave the country and return to Australia in May, the GPO agreed to allow him to remain in the country as a tourist until his departure, following lobbying on his behalf by the Foreign Press Association and others.